This morning’s update on initial jobless claims offers more encouragement for thinking that the economic contraction has bottomed out. That’s still distinct from proclaiming the arrival of a recovery worthy of the name, as we’ve been discussing for months, including here and here. 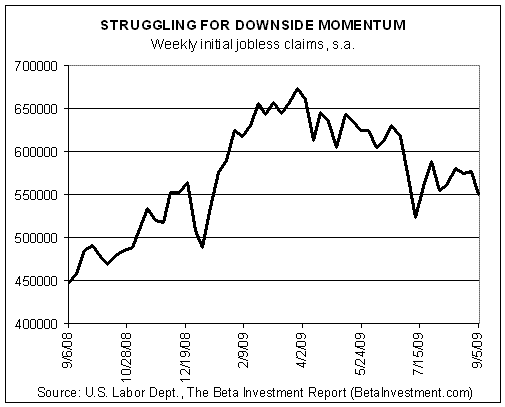 Nonetheless, the downward trend in initial jobless claims—a valuable leading indicator of the business cycle, as we explained back in March—continues to signal that the recession on a broad macro scale is over or nearly over. Granted, last week’s decline in new filings for jobless benefits to 550,000—the second-lowest so far this year—may be skewed because of this past weekend’s Labor Day holiday. As always, we’ll have to wait for more number crunching by our trusty servants in Washington. Meantime, the chart below doesn’t give us any reason to think that initial claims aren’t biased toward lower levels in the future, albeit erratically and slowly, but downward nonetheless. Another encouraging trend in today’s unemployment numbers arrives by comparing initial claims with so-called continuing claims, by far the higher number of the two. Indexing this pair to measure the trends on an apples-to-apples basis suggests that we’re finally seeing some progress in reducing continuing claims, as our second chart below shows. Continuing claims reflect the ranks of the unemployed who’ve previously been collecting jobless benefits. A decline in this series suggests—emphasis on “suggests”—that people who’ve been on the unemployment rolls are finding work. Generally speaking, a decline in initial jobless claims is all the more persuasive if continuing claims are falling too. As the second chart directly above suggests, there now appears to be greater downward momentum in both series, which is encouraging, at least on its face. We qualify the last point because it’s not yet clear if the decline in continuing claims is a quirk. 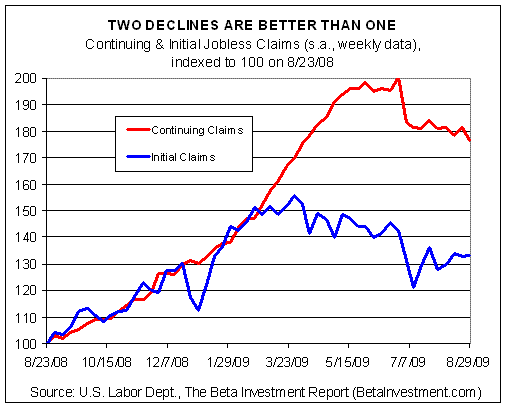 One possibility is that continuing claims is falling for less than bullish reasons. For example, the shrinking number of continuing claims may reflect that the jobless are falling off the government’s radar because their unemployment benefits have expired. In short, the data looks mildly encouraging as reported but we’re still a long way from declaring the Great Recession over as it relates to Main Street. (Wall Street’s perspective is another story.) But this much is clear: a recovery of some degree in the labor market is critical in order to repair the damage of the past year or so. Today’s numbers tell us there’s still a lot of pain, but at the very least today’s report suggests that the trend isn’t getting any worse and maybe, just maybe, it’s getting marginally better.